You are probably thinking it’s a no brainer, right? Kale is a vegetable. So why would a dietitian tell someone not to eat a vegetable?! Well, that’s not what this blog is about. Clearly vegetables should be a part of everyone’s diet, and most people probably don’t eat enough, but what I’m questioning is whether or not kale really lives up to all the hype. It’s been touted as a super food that fights cancer, slims waistlines, and improves mood and brain health, just to name a few. Anyone who has read this blog before already knows that I am not a fan of labeling any one food as “super”. No one food alone is enough to sustain human life. We need variety, not just for nutrient balance, but for pleasure. People seem to forget that eating too much of a healthy food can cause problems too, which is why I believe it’s all about balance and moderation. Case in point, did you know that kale contains oxalates, which in high amounts can impair calcium absorption and cause kidney stones? That sure doesn’t sound fun! I even have a friend whose good friend got on a kale kick and started eating it daily. After awhile he started feeling unwell and got a weird rash on his palms. He even had blood thickening problems. His doctor told him to quit the kale. I know that’s just one person’s (extreme) experience and not exactly a scientific experiment, but it still points to the problem of too much of a healthy food. So we shouldn’t over do it, but my real question is, is kale so darn great that we should all be shunning our spinach and other leafy greens in favor of it? First, what exactly is kale? It’s only become mainstream the past couple of years. Kale is part of the cruciferous vegetables family, which also includes veggies such as cabbage, broccoli, spinach, and Brussels sprouts. At first glance, nutrition-wise kale does look pretty good: 1 cup of kale contains about 35 calories, 2 grams protein, 3 grams fiber and a small amount of omega-3 fats in the form of alpha linolenic acid. Not too shabby. 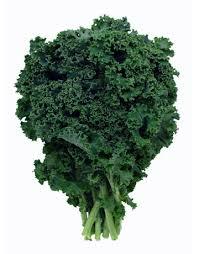 Kale also contains high amounts of vitamin C, vitamin A and vitamin K (hence my friend’s blood-thickening issue), as well as iron, calcium, copper, potassium, manganese, and phosphorus. Man, sounds like a multivitamin! It is important to note that vitamins A and K are fat soluble vitamins, which can be stored in the body if eaten in excess. This means it is possible to get vitamin toxicity if you get too much of them (unlike water soluble vitamins, which your body will typically just excrete excessive amounts of through the urine). To put this in perspective, the recommendation for vitamin K is 90 mcg per day and 1 cup cooked kale contains 1062 mcg- that’s over 10 times the recommended daily amount! Although one day of eating an excessive amount of vitamin K won’t hurt you, doing it day after day on an ongoing basis could. A lot of people (present company included) are on green smoothie kicks these days, but if you are drinking one daily you could be getting more of some of these vitamins than you need, especially if also taking a multivitamin. But back to the positive. Kale is also a good source of many phytonutrients, including carotenoids and flavonoids, among others, which act as antioxidants in the body, protecting the body from free radical damage. The carotenoids lutein, zeaxanthin, and beta-carotene promote eye health as well. So kale certainly is packed with health promoting nutrients. That’s all great, but how does it compare to its sister leafy green spinach? As you can see, Popeye’s favorite green is not too shabby itself. Although lower in some vitamins (which as noted above, it is possible to get too many of anyway), spinach is actually higher in protein and fiber. Spinach also contains many of the same phytonutrients as kale, including lutein and zeaxanthin. So should you dump your spinach in favor of kale? I say no. Both are nutritious and because they taste slightly different they can be used in different dishes. One other consideration with kale is pesticide residue and overall cleanliness. I’ve ran across some slimy doodads while washing my kale-I don’t even want to know what they were! It’s easy for dirt and bugs to get stuck within kale’s curly leaves, so be sure to wash your kale thoroughly. Another consideration is pesticide residue. You’ve probably heard of the “dirty dozen”, the list of the top 12 fruit and vegetables with the highest level of pesticide residue. Kale isn’t on the list, but it’s not too far off (perhaps it’s part of the baker’s dirty dozen). If you can afford organic kale that helps since organic vegetables are grown without the use of pesticides. It is of note that most dietitians, self included, believe that the benefits of eating vegetables probably outweigh the cost, even if you can’t afford organic. Again, just be sure to wash thoroughly! Bottom Line: Kale is a nutritious vegetable, but certainly not the only one. Fruits and vegetables should be a large part of your diet (5-9 servings/day) but if you don’t like kale there are plenty of other nutritious leafy greens to try, such as spinach or arugula. Aim to incorporate kale or other cruciferous veggies 2-3 times per week (a serving size is one cup raw). Remember, different colored vegetables have different nutrients, so aim to eat a colorful mix! Toss kale pieces in olive oil to coat evenly. Bake at 350°F until crisp, but not browned, usually 10-12 minutes. Sprinkle salt on cooked chips and enjoy! This entry was posted in General Health, Should You Eat.... and tagged kale. Bookmark the permalink.